Wanna give tailgating a try? A die-hard Bears fan tells us how to expertly drink, grill and—come winter—keep your limbs from freezing off. 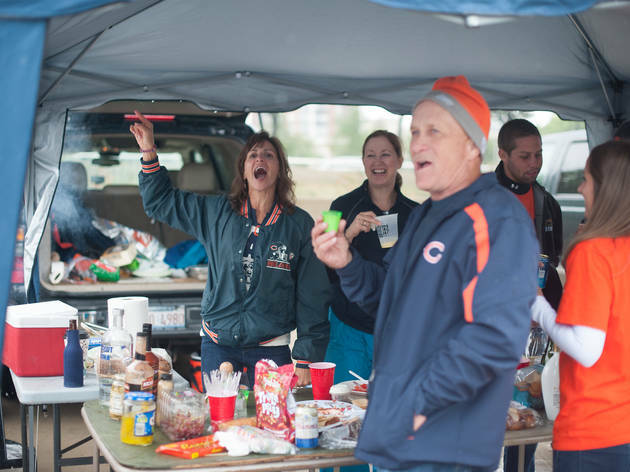 Photograph: Mark Wright Chicago Bears fans tailgate before the game against the Minnesota Vikings at Soldier Field on September 15, 2013. Don’t ask Steve Christensen over to watch the Bears’ home opener; he’s got plans. Christensen, 30, of Logan Square, is one of many who tailgates before every home game in parking lots around Soldier Field. So if you’re tailgating-curious but nervous about parting the sea of orange and blue, Christensen brings you tips from his more than seven years of hard-core experience. Plan ahead. On Tailgating Eve (you do celebrate, right? ), marinade the meat, boil the brats, chop the onions, load the beer in the car. “That way you don’t have to worry about doing anything in the morning other than just dragging yourself out of bed.” If you don’t have Bears parking passes, your best bet may be the 31st Street lot at South Moe Drive, which offers cash parking ($25 per car). Don’t invite Oscar Mayer to the festivities. “Go to the butcher, spend the money, get good steak, get good ribs, get interesting, different sausages.” Football tailgating is a special occasion; splurge instead of buying everyday food. Man the flames. “I’m a big advocate of that Match Light charcoal. A lot of purists say that you can’t use it, but I would say when it’s windy on the lake at seven in the morning, I want something I can drop a match on and it lights.” Think ahead: Bring a gallon of water to dump on your coals. “A lot of people will just take their charcoal and flip it over on the parking lot and leave the hot coals there.” We know you’d walk across hot coals for your Bears, but you shouldn’t have to. 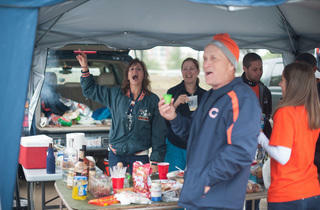 Find the tailgating rules at chicagobears.com/tickets/comingtoagame.asp.